Be the first to share your favorite memory, photo or story of Marlene. This memorial page is dedicated for family, friends and future generations to celebrate the life of their loved one. 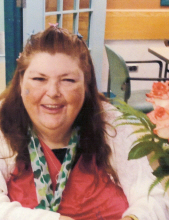 On Tuesday, February 5, 2019 Marlene Dickson of Beausejour, Manitoba passed away peacefully at the East Gate Lodge at the age of 56 years. Marlene will be lovingly remembered by her mother, Ethel Dickson of Wainwright; brothers, Bob (Janet) Dickson of Chauvin, their son, Blair (Taneil) Dickson and their children, Kale, Lincoln and Kolby, Ken (Judy) Dickson of Edgerton and their children Josh Dickson and Kale (Jaylene) Dickson and their children, Keirah and Klaire; sister, Eileen Dickson of Red Deer, Alberta. She was predeceased by her companion, Emile; her father, Gordon; brother, Douglas and nephew, Chris Dickson. "Email Address" would like to share the life celebration of Marlene Ethel Dickson. Click on the "link" to go to share a favorite memory or leave a condolence message for the family. Creech's Funeral Centre Creech's Crematorium Ltd.
Creech's Funeral Home Wainwright Funeral Services Ltd.
Crossroads Funeral Chapel Creech's Crematorium Ltd.